Welcome to the latest edition of the proverbial unstoppable force clashing with the immovable object with the prize in this one being a trip to the Final Four. Gonzaga's been there and done that but has yet to grab the just-as-proverbial brass ring. This year, though, is Mark Few's best team yet. Texas Tech has never been to the Dance's ultimate weekend, and this is Chris Beard's best chance to date of breaking through. 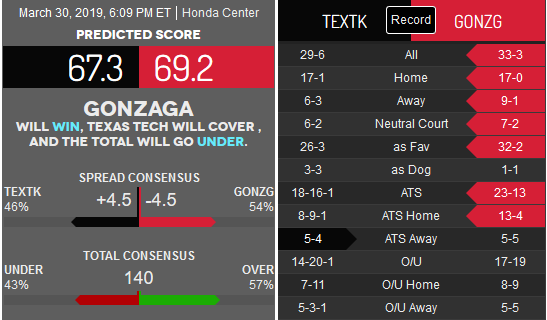 Bovada has moved the line to Gonzaga -5, the total has risen to 140, and the moneyline remains Texas Tech +175 and Gonzaga -210. Good defense never goes outta style, so the Red Raiders have been playing with a pat hand all season long. Interestingly, Northern Kentucky is the opponent to date to play Tech close in the tourney, and they lost, 72-57. The more highly-touted Buffalo Bulls and Michigan Wolverines lost by 20 and 19 points, respectively. As usual, possible lottery pick Jarrett Culver leads the way on offense, scoring 18.9 points per game, dishing 3.8 dimes per game, and adding 6.4 boards per game. The Zags are the field's most Dance-hardened team, making 21 straight appearances, 5 straight Sweet Sixteens, and three Elite Eights in the last five seasons. As well, no one puts together a more challenging non-con schedule. In fact, Gonzaga strong-armed the West Coast Conference to cut league games from 18 to 16 so they could add more Dukes and the like. The Bulldogs go nine deep and can easily expand that rotation when required. Just ask Florida State. That game lived up to its billing as a war where physicality and defense took center stage. Not that there was ever any doubt, but the Zags can play that sorta style. Full marks to the Red Raiders' defensive standing, but it's hard to believe they're more intense than the Seminoles, who were bloody impressive against Gonzaga. And they still lost. It's a fairly safe bet that Culver, Rui Hachimura, and Brandon Clarke will be playing against each other at the next level. Right now, that's a 2-to-1 Zag advantage, and all indications are their supporting cast has the edge. We made the point last weekend that the short turnaround between games usually puts an emphasis on coaching. Beard's high-quality, but Few has more versatility with his roster and keeps them poised for any eventuality. Expect that to be the difference. Enter to win our March Madness Bracket Contest! All you need to do is pick the most winners, with our point system giving more weight to later-round winners. This is a pool for players, if you get our drift. As well, we'll have re-sets for each round. You'll never be out of it, so get in it to win it!